The site of a Bronze Age round barrow, visible as earthwork on Salthouse heath, on 1946 RAF aerial photographs. The barrow was excavated in 1850, when several cremation urns, urn fragments and flint tools were recovered. Subsequent disturbances, particularly World War Two trenches, have left the barrow somewhat mutilated. Barrow 12.2m (40 feet) in diameter, 1.5m (5 feet) high. Undecorated urn (NCM), large, of brown clay filled with sand, charcoal and burnt bones. 90cm (three feet) from the surface in centre of barrow was another fine urn surrounded by wall of flints. Urn 44.5cm (17 1/2 inches high, 56cm (22 inches) round base plain. Fragments of another urn also found. Barrow recently disturbed by rabbiters; large urn fragments at 1.2m (4 feet) (collared urn in NCM) filled with burnt bones but broken previous day by rabbiter. Not in centre of barrow. In centre at 90cm (3 feet) from surface, urn surrounded by large flints standing on bed of gravel at level of natural. Complete biconical urn. Fragments of another urn on southeast; probably Beaker. Cutting in NCM Bolingbroke collection says 'In Farthing Hill on Salthouse Heath a large flint implement was found by Mr Greville Chester and given to the Norwich Museum'. Mound now 15m in diameter, 1.4m high, gorse covered, mutilated. Copy of photograph of urn in file. Earthworks of round barrow, visible on the 1946 RAF aerial photographs (S1). The diameter of the mound appears to be around 15m. 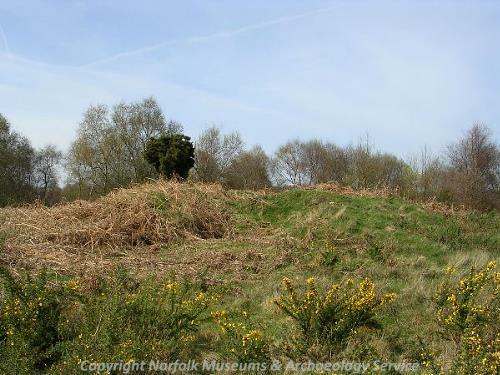 Trenches and pits have been dug into the mound, which have previously been interpreted as excavation trenches. However the 1946 RAF aerial photographs (S1) would indicate that these trenches were World War Two in date (see NHER 27880), although these may have incorporated the line of existing trenches. May 2003. Field observations. National Grid Reference obtained by Global Positioning Satellite; TG 07730 42009. Under bracken with one lonely gorse bush on top. Hollow in top and into one side, presumably earlier (? World War Twp)) excavations. --- Photograph: HQ 3, 5, BVR 1-3, HQ 10-12, CXV 9. --- Monograph: 1901. The Victoria History of Norfolk. The Victoria History of the Counties of England. Vol 1. pp 272, 277. --- Archive: Ordnance Survey Staff. 1933-1979?. Ordnance Survey Record Cards. TG 04 SE 15 . --- Archive: Clarke, R. R. and NCM Staff. 1933-1973. Norwich Castle Museum Record Card - Bronze Age. Salthouse . <S1> Vertical Aerial Photograph: RAF. 1946. RAF 106G/UK/1571 3166-7 07-JUN-1946 (NMR). <S4> Article in serial: Chester, G. J.. 1859. Account of the Discovery of Ancient British Remains, Near Cromer. Norfolk Archaeology. Vol VI pp 263-267. <S5> Article in serial: Archaeological Journal. Vol VII, pp 392-3. pp 392-393. <S6> Article in serial: Harrod, H. 1852. On the Weybourne Pits. Norfolk Archaeology. Vol III pp 232-240. p 236. <S7> Article in serial: Clarke, W. G. 1913. Norfolk Barrows. The Antiquary. Vol XLIX pp 416-423. p 421. <S8> Publication: Grinsell. 1953. Ancient Burial Mounds. p.66. <S9> Publication: Abercromby, J. 1912. A Study of the Bronze Age Pottery of Great Britain and Ireland and its Associated Grave-Goods. Vol 2. Plate XCVI Fig 480.